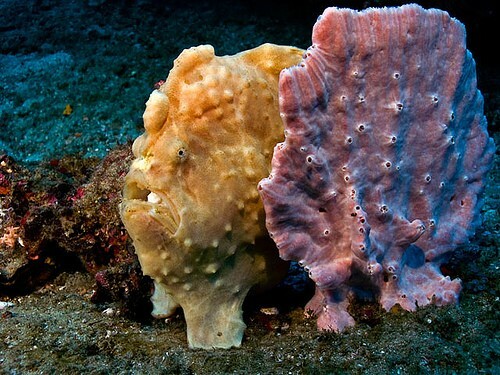 The object on the left is a Frogfish, the object on the right is a sponge, try and look away. Frogfish are one of those weird & wonderful underwater inhabitants that divers simply love to discover. In addition to their superb camouflage, their incredible variety of color and texture make them fascinating to observe, while their behavior is equally unusual. Frogfish do not have scales – which other fish use as a form of protection and defense from predators, instead they rely entirely on their camouflage to keep them safe. The color of their body depends on the habitat, Frogfish can be white, yellow, beige, pink, green or black colored. Coloration can also vary within one species, making it difficult to differentiate between them. Some resemble stones or coral, while others imitate sponges or sea squirts with dark splotches instead of holes. Their camouflage can be so perfect, that sea slugs have been known to crawl over the fish without recognizing them. Frogfish generally do not move very much, preferring to lie on the sea floor and wait for prey to approach. Once the prey is spotted, they can approach slowly using their pectoral and pelvic fins to walk along the floor. Alternately, they can move in something like a slow gallop, whereby they move their pectoral fins simultaneously forward and back, transferring their weight to the pelvic fins while moving the pectorals forward. 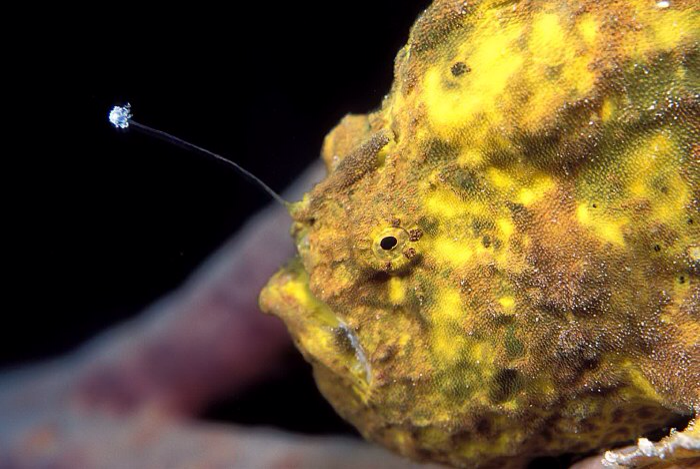 Contrary to typical dorsal fins, the first dorsal fin of a frogfish is modified into a moveable fishing rod or luring apparatus (illicium) tipped with a fleshy lure or bait (esca). 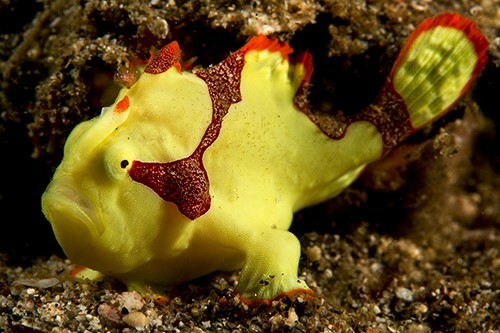 The shape of the lure is one of the main distinguishing marks used to help identify a frogfish. The lure often but not always mimics a small animal. The lures of some species are shaped like a worm, others like a shrimp or even like a small fish with an eye-spot and appendages resembling fins. 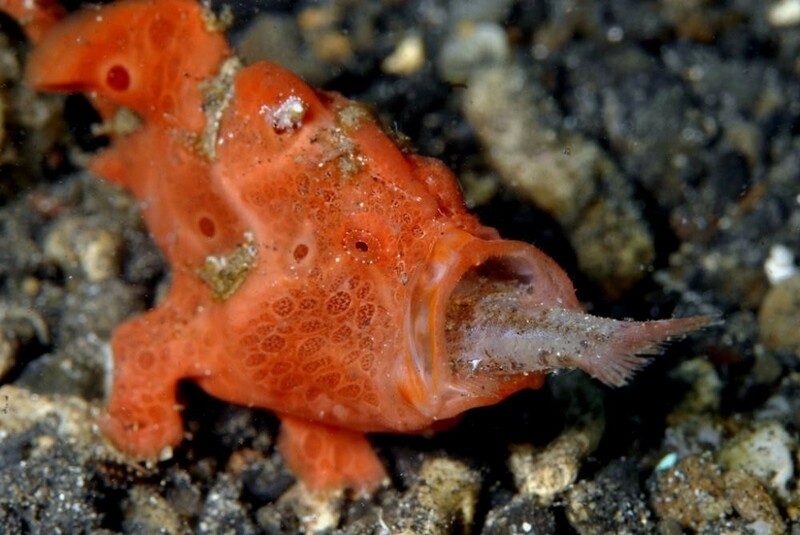 While using the lure the frogfish even imitates the way in which that particular animal would move. Using mimicry to catch prey is called aggressive mimicry. Frogfish eat crustaceans, other fish, and even each other. When potential prey is first spotted, the frogfish follows it with its eyes. Then, when it approaches within roughly seven body-lengths, the frogfish begins to move its luring apparatus (illicium) in such a way that the bait (esca) mimics the motions of the animal it resembles. As the prey approaches, the frogfish slowly moves to prepare for its attack; sometimes this involves approaching the prey or "stalking", while sometimes it is simply adjusting its mouth angle. The catch itself is made by the sudden opening of the jaws, which enlarges the volume of the mouth cavity up to 12-fold, pulling the prey into the mouth along with water. The attack can be as fast as 6 milliseconds. The water flows out through the gills, while the prey is swallowed and the esophagus closed with a special muscle to keep the victim from escaping. In addition to expanding their mouths, frogfish can also expand their stomachs to swallow animals up to twice their size. After reading all about the Frogfish, how amazing would it be to spot one in its natural habitat? It just so happens the Philippines is frogfish heaven. Whether you are diving the famous Apo Island, with its wonderful coral reef or exploring the local reefs and muck dives, there are frogfish wherever you look. Join Just Add Water on our trip to the Philippines to not only see a Frogfish but other weird and wonderful underwater inhabitants. Click here to for more information on our Philippines trip.